Our worship life at the Cathedral is about giving God thanks and praise for the blessings that God bestows upon us. We pray together. We confess our sins and receive God’s absolution. We hear the Word of God and a message of interpretation and encouragement related to the passages. We participate in the Sacraments of the Church. We listen to beautiful music and sing the praise of God together. All of the aspects of worship fill us with God’s love and grace to bring the church into our everyday lives. Throughout the week we celebrate Holy Communion, the principal service of our church, where we pray, read scripture, and eat bread and wine together. The rites and rituals of our worship are grounded in the Episcopal Church and in accordance with The Book of Common Prayer, 1979. The rich diversity of God's children at St. Paul's is reflected in an attitude of openness to new inspiration in worship. This service is simple in nature using the traditional language of Holy Eucharist Rite I. It is an entirely spoken service with no congregational singing. Occasionally, we have musicians who are invited to play for us in order to ponder the love of God. Sunday at 9am is our largest service of Holy Eucharist which families of all ages attend. The service includes a full choir, congregational singing, a full sermon and a children’s message in the contemporary language of Rite II. Sunday at 11am is our grandest and most traditional of our services. The service is Holy Eucharist Rite I and is from the high altar. The service includes a full choir, congregational singing, a full sermon and a children’s sermon. The first Sunday of every month we offer a Taizé service at 5pm. This is a meditative service that has roots in the religious community of Taizé, France. Silence and singing are the primary vehicles of prayer and participation. A few words are chanted over and over. Gradually, like the Spirit of the Divine, the sounds and silences move beyond the intellect and penetrate the heart and whole being. We offer prayers together and burn the prayers from our prayer box at the end of the service. On the second Sunday of the month (September thru May) we offer Evensong followed by a concert. Evensong is a chanted Evening Prayer service that combines prayer, music, chanting, and hearing God’s Word. It is a beautiful time of experiencing the ancient practices of the church. We close this service with a concert. The combined service and concert last approximately one hour. Worship in the middle of the week is important to many who work in our downtown community who desire a worship experience. 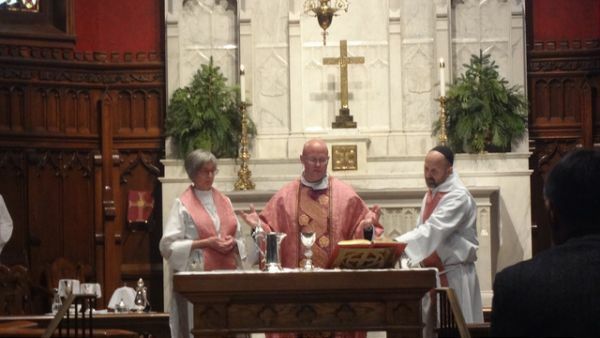 This service takes place in our chapel and is a spoken service of Holy Eucharist. It includes a short homily and often focuses on a special feast day of the church.